The best way to start PhoneGap project is to use its command line interface (also called Cordova CLI). Its a little handy tool which is used from the command line with many pre-built Cordova helper methods. We are sending create command to the cordova utility together with the application directory name, unique id (reverse domain name serves as unique app id) and a title of the new application. All of these can later be changed in the project’s config.xml configuration file. PhoneGap relies on mobile OS SDK’s being available on your development machine. This is a separate procedure to download and install them. You can find these on the mobile OS developer sites. I’m going to use iOS project as and example for this tutorial and this requires me to have Apple Xcode installed. Android SDK has its own requirements. First line adds Cordova iOS platform to the project (again by using Node’s npm). The second one shows what platforms are added to the project and which ones are available. Third line builds PhoneGap project for iOS platform. What exactly did this command for adding platforms did? It has created new directory within your project platforms directory. It does it for each different mobile platform you add in order to maintain separate file sets. And what about cordova build ios? This command has copied files from your main www directory and builded .app file in order to be tested in iOS simulator (in my case its HTMLCenterHello.app). Usually, very first build run requires more compilation time but subsequent builds are much faster as Cordova is reusing already compiled components. 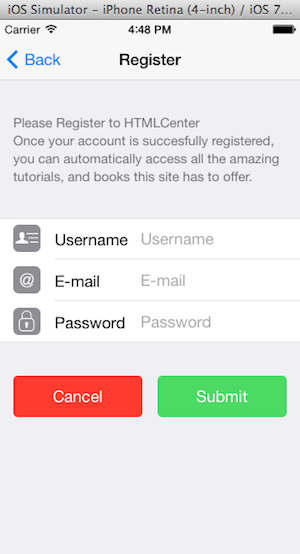 Your projects/ios directory now contain a fully working iOS native application project. Once I open it in XCode and run the emulator I can see a native iOs app which is running default PhoneGap mobile web application in it. While replacing existing html, css and js files we will maintain the example index.js file as it contains example code how to bind to events Cordova framework distributes to your app. Just copy the index.js file to you Framework7 project js directory and reference it in the index.html file. This is how I updated references in index.htm for our example project. After copying all the files and adding index.js we launch the app from within XCode and our Framework7 application is now running within iOS simulator as native iOS application. It still has all the functionality we added in previous tutorials. Users can register and login, and their details are being saved and validated on Parse BaaS platform. 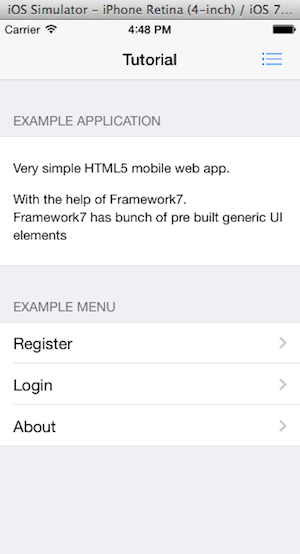 In this tutorial, we have created new PhoneGap project, generated iOS build and converted Framework7 based mobile web application to a native iOS app. The native app we have generated is very simple, but it already has navigation, transitions, secondary side views and HTTP communication (cloud APIs) enabled. Next natural steps for development would be to create application icon, add loading view and add more screen views. You can find a source code for the application we created during all 3 parts of this tutorial in PopularOwl Labs repository on GitHub. Any improvement suggestions are most certainly welcome. Let us know! Plz tell me..How to integrate Framework7 into my Cordova Project? Is it any git url or npm package? Delete the contents of your Cordova project www folder after first copying the js/index.js file to your FW7project /dist/js and referencing it in that index.html file, then copy everything in dist folder to Cordova project www folder.